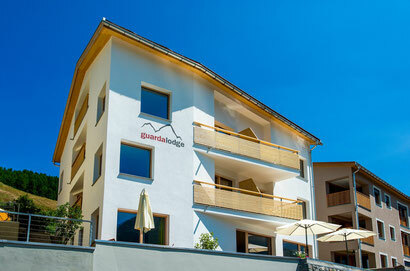 Guarda Lodge lies on the sunny side of the beautiful new village quarter of Schellenursli-Dorf. This B&B hotel is the perfect point of departure for relaxing walks and mountain bike tours, and is ideally situated for exploring the Engadin and the Swiss National Park. Come up (to 1700 metres) to wind down: Guarda Lodge is the perfect place for you to enjoy a getaway. Here you can take a break from the hustle and bustle of daily life. We offer large, modern and comfortable rooms and a delicious breakfast with regional produce. All the rooms come with a small balcony, bathroom/shower and WC, radio/TV/tablet and free WLAN. Check-in is from 1 pm to 10 pm. We will be there to greet you in person from 3.30 pm to 7 pm. At other times, you can speedily check in using the key safe in the garage. We kindly ask you to vacate the room by 10.30 am on the day of parture.